Talk about handy! Our Clear Handled Storage Basket makes it easy to store like items together and then grab them all at one time. 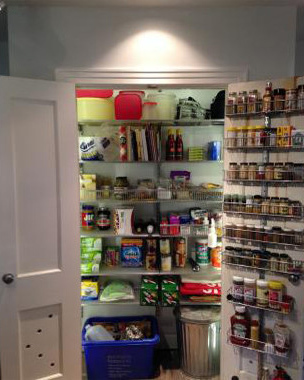 It's ideal for storing canned goods, dry goods or medications in upper and lower cabinets or in the kitchen pantry. The handle makes it easy to pull it from the shelf. Does the maximum measurement of the length (12 3/4&quot;) include the handle? If so, what is the maximum length of the basket bottom w/out handle? The 12-3/4&quot; length includes the handle. The bottom of the basket measures 9-3/4&quot; long x 7-1/2&quot; wide on the inside. Are you able to stack these baskets on top of each other? No, these baskets are not designed to be stacked. What is the weight capacity for this? how many lbs can this hold? Our Large Open Handled Basket can accommodate up to about 4 pounds.